As discussed in the last post, perceptions regarding pay for performance may vary by level in an organization. Although most would agree that no one believes their system is perfect, perceptions on how well this compensation strategy accomplishes it stated goals varies. So, what are some of the steps taken by organizations where perceptions approximate each other across levels? • Utilizing multiple levels of review of scoring. When examining specific process components, several areas are critical. 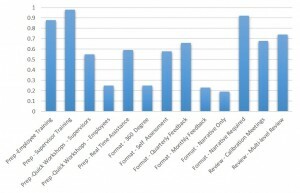 Utilizing a national survey by HCS of 400 firms with more than 250 employees, the most common practices among successful organizations pertained to preparation, format, and review processes. The results of the survey appear in Figure 1. As shown in the figure, most successful organizations train staff and supervisors. Approximately half (55 percent) offer quick prep sessions to remind supervisors of the process and helpful hints before the reviews are conducted. Almost 60 percent provide real time assistance during the review process to assist with resolving any review issues. Although around only 25 percent utilize 360 degree evaluations, self-assessments are a key part of the process in approximately 58 percent of respondents. 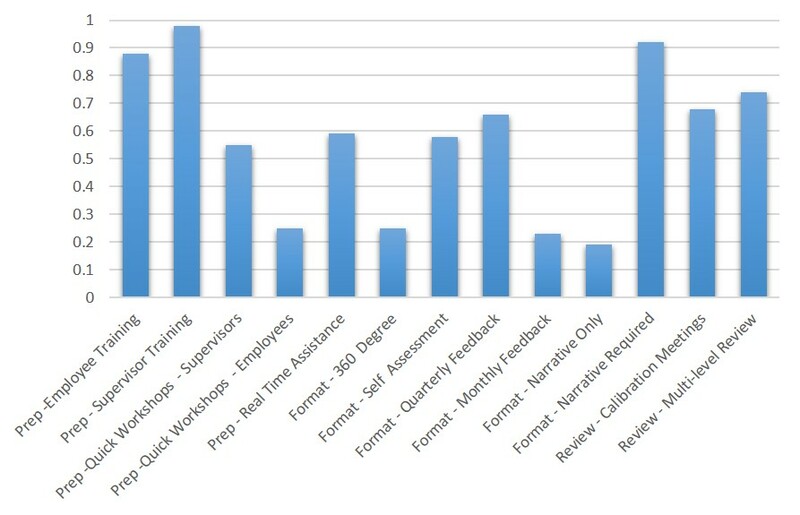 More than 60 percent give quarterly feedback and more than 90 percent require narrative in the review. During the review process, around 68 percent conduct calibration sessions, while almost 75 percent utilize multiple level validations. Although each organization is different, these elements seem fairly universal among those that are successful with pay for performance. This entry was posted in Compensation, Organizations, Performance and tagged compensation, customer experience, pay, pay for performance, performance reviews, reviews. Bookmark the permalink.